1. Bake a 10 x 14" rectangle chocolate moist cake (low fat milk, brown sugar, flour, soda and powder, vanilla and eggs) then chill. 3. Wipe with cake utensil the icing to a chilled cake. 4. Decorate with flower and toy candies. 5. Decorate the top edge and bottom edge of the cake with white icing and design with mini flower candies. 6. Write greetings by using color icing. Very pretty colors ! You did a nice job! Join in and write your own page! It's easy to do. How? 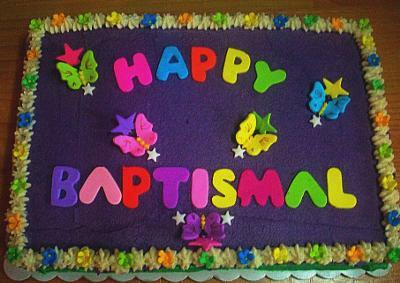 Simply click here to return to Baptism Cake.